Bloomberg News -- "Target hasn't opened a single store in Canada, and already Wal-Mart wants Canadians to know it's the price leader north of the border. Wal-Mart Canada will lower prices on 10,000 products in July. The company called the sale, which it says will save customers $50 million next month, the biggest in Wal-Mart's 18-year history in Canada. While Target's Canada debut is at least six months away, part of Wal-Mart's strategy is to get out front in the brand messaging wars. Minneapolis-based Target plans to open more than 100 stores in Canada starting next year. Last year, Target paid $1.85 billion to acquire the leases of as many as 220 Zellers stores, a Canadian discounter, with plans to convert many of them into Targets." MP: Some of the economic lessons here are: 1) consumer sovereignty, 2) intense "cutthroat" competition is good for consumers, 3) Walmart's everyday low prices provide obvious direct benefits and cost-savings to its own customers, but also provide indirect benefits and cost-savings to all of those customers who may never shop at Walmart and only shop at Target or other retailers. Reason? 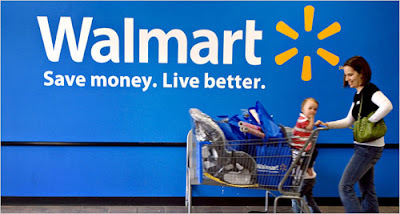 Walmart's low prices provide a powerful form of price discipline on all of its competitors, who would be able to charge higher prices in the absence of Walmart. Bottom Line: Walmart is the consumer's BFF, even for those consumers who NEVER shop there. Here's to hoping the Canadians don't interpret Walmart's competitive price-slashing as anti-competitive, as Walmart is often accused of in the US. But wait! Wal-Mart is an evil, faceless corporate entity! All they care about is money and using the tears of slave children to wet their lips. How could they possibly do anything good? Besides, there is a global conspiracy between all the big box stores where they only raise prices. We must destroy all the Wal-Marts in Canada. Only by removing their source of affordable goods can we help them. In case Canadians interpret Walmart's low prices as anti-competitive, they should be reminded that Walmart's prices aren't maximums, rather they're minimums. Canadians should feel free to offer to pay Walmart prices above the advertised prices if they think that will be more competitive. I have a theory on this: folks like that (let's call them the saviors) realize they need the poor, otherwise they have nothing. Therefore, the saviors keep the poor in a perpetual state of poverty by shutting down avenues of improvement (such as Wal-Mart or factories in 3rd world). That way, the saviors always feel needed. Target and Walmart customers are close - but different enough that both can exist. Target shoots a bit higher up the customer chain. At least that's what I notice in the Chicagoland area. Of course, it might go without saying...that every new WalMart employee will have FULL health care benefits so their wages can be spent on other things they need. I agree with you, Moe. Target does try to aim a bit more towards the higher end. You can even see that in the products they offer. While Wal-Mart offers generic products, Target has their own line of home goods: cheap yet stylish items. Goes to show another important aspect of economics: when you can't compete on price, compete on service! You'd be surprised: most full-time Wal-Mart employees do have health insurance. The part-timers, not as complete coverage but they do get something. No mention of my linking skilz???? *sniff* You're all grown up. Making me so proud. Wal-Mart has done more for the 99% than any politician or government program. And today it traded at a well deserved all time high. Food Stamps help enhance Walmart's bottom line? Don't worry, Sethstorm won't learn a single one of them, due to Wal-Mart's "pro-slavery" policy of paying its workers less than 3x a "living wage". Not really. Target customers are liberal idiots who hate Walmart senselessly. Walmart customers are, by contrast, people with brains. I had $10 in Target gift cards a couple months back. I spent an hour in the store trying to find anything that Walmart didn't sell notably cheaper. Note: I will grant Target a kudos, though. I wanted some suction cups -- Walmart and Lowes BOTH had the exact same single, solitary item, a "suction cup" that was such garbage that it literally would not stick to clean GLASS. Not even if you wet it first! I decided to pass by Target and see what they had. For this one single item, they did have a much wider array of options, including pretty much exactly what I'd gone to Lowe's expecting to find. The only country that delivered a loss to Wal-Mart in labor relations is Canada, via Jonquiere. Unfortunately they thought to be spiteful instead of willing to work. The problem with these particular EDLP is that they make products worse - since manufacturers have to cut the quality or featureset of a product to meet an overly stingy company. The problem is that they end up with a lot of part-timers(by hours) that get full-time tasks. Wal-Mart dusts off their plan to demonstrate that they have the option for care - which is about as substantial as a prop on a movie set. The other choice, the more prevalent and practical, ends up being the various federal programs that are promoted by the company. When the company from Bentonville has to do all of the things it has paid good money to avoid, the opinion might change. I wonder if WalMart offers health insurance to it's employees in Canada or not. or for that matter, in any other country other than the US. That's an example of the corner-cutting that Wal-Mart promotes to meet a price level. One more reason that the better company is not the one with a dedicated labor relations emergency line, nor the one is effectively an arm of the People's Republic of China for its un-American interests, nor the one that doesn't understand the meaning of "no" when people don't want their presence. Shame Costco hasn't expanded since they don't do badly by their own and don't do badly by their customers as well. People's actions rarely match with their words. If people truly wanted no Wal-Mart in their town, they'd not shop there. But they do. If it takes a PR team to manipulate/corrupt/hand-wring a city council in order to go against the wishes of their constituents, it is safe to say that no was the answer. People still shop there, dingus. if they did not Wal-Mart in their town, they would not shop there. but they do. Do some of these people use to money they make to buy into the insurance programs offered by Walmart? Why should Walmart finance these choices some of their employees make? "Why should Walmart finance these choices some of their employees make?" I thought choice was good. Sethstorm complains if employees have choice, and if they don't have choice.